The ‘Cope India’ military exercise holds broader significance for the bilateral relationship. 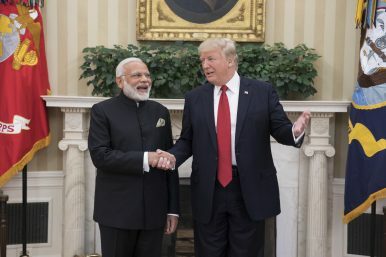 In June 2017, Prime Minister Narendra Modi and U.S. President Donald Trump underlined the central role of India and the United States in maintaining peace and stability in the Indo-Pacific region. Recalling the tenets of the UN Charter, the two leaders emphasized the underlying importance of sovereignty and international law which should be universally respected in order for every nation to prosper. This emphasis on strategic alignment has continued onto 2018 and its principles were reiterated again during the first U.S.-India 2+2 Strategic Dialogue held in September 2018. These principles and commitments have also formed the substantial basis for Washington and New Delhi to firm up their strategic and military engagements for the last several years. In accordance with the bilateral commitments to a free and open Indo-Pacific, the Indian and the U.S. Air Forces have come together for a 12-day joint exercise dubbed “Cope India 2019” to be held through the end of this week (December 3 to 14). This is the fourth iteration of the exercise conducted by the two militaries. The previous editions of the Cope India Exercise were held in 2004, 2008 and 2009 respectively. But none have been held since then, making the current exercise an indicator of the renewed mutual U.S.-Indian interest in deepening their military engagement. The exercises are being hosted at two air force bases in India – Air Force Station Kalaikunda in Midnapore and Air Force Station Arjan Singh at Panagarh, both located in the eastern Indian state of West Bengal, not too far from the Sino-Indian border where Indian and Chinese forces were locked in a confrontation in 2017. It should be noted that the second hub of the U.S.-supplied C-130J Super Hercules transport aircrafts of the (IAF) is also hosted at the Arjan Singh Station. The U.S. complement includes 200 U.S. Airmen with 15 aircraft from the 18th Wing, Kadena Air Base, Japan, and 182nd Airlift Wing, Illinois Air National Guard. The Indian side is being represented by Su-30MKI, Mirage-2000, Jaguar, C-130J, as well as AWACS. The Special Forces from the both the USAF and IAF are also taking part in the exercise. The restarting of the Cope India exercises appears to be yet another indicator of the slow but growing comfort level in India about military engagement with the United States. Despite concerns by some in the Indian strategic community, India has signed the Logistics Exchange Memorandum of Agreement (or what is now called the Logistics Services Agreement) and the Communication and Information Security Memorandum of Agreement (or what is now called the Communications Compatibility and Security Agreement). These agreements are further boosting the U.S.-India military relationship. But India has yet to sign the Basic Exchange and Cooperation Agreement, another of the foundational agreements that the United States has been pushing. India had early on signed the General Security of Military Information Agreement. These agreements and military exercises tie India and the United States closer militarily. This also suggests that U.S.-India military exercises are likely to increase in scope and intensity in the coming years. Notably, India is also stepping up military exercises with other countries in the Indo-Pacific that may be considered like-minded and also have close ties with the United States. For example, India is also conducting a joint air force exercise with Japan, at the same time as the Cope India exercise with the United States. While India’s bilateral military exercises are increasing with many countries, there are not as many multilateral joint exercises, even though the logic of carrying them out is quite clear. In some cases, such the Malabar exercise, there appears to be concern about the kind of message being sent with such exercises, especially to China. On the other hand, it is unclear why New Delhi feels that large numbers of bilateral military exercises will be more acceptable to China. What this suggests is that India continues to want to both build up its military ties with like-minded countries, but also assuage any concerns in Beijing about India forging closer ties with potential adversaries. Whether this delicate balancing act will work remains to be seen. A closer look at the second handshake that U.S. Defense Secretary Ash Carter referred to.